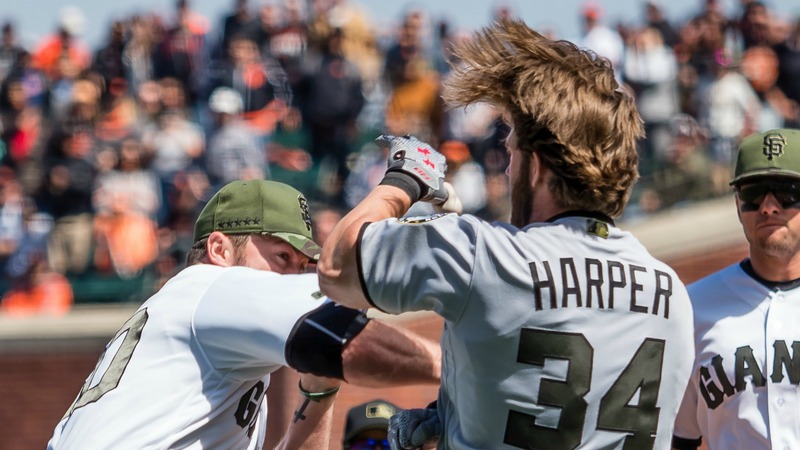 What if Giants reliever Hunter Strickland told Posey that he was going to drill the Nationals’ Bryce Harper – and that Posey should not intervene if Harper charged the mound, not try to prevent a fight? A coach with another club reached out to me and relayed that theory after I posted my original column on Posey late Monday night, a column that examined the catcher’s decision to stand frozen behind the plate as Harper went after Strickland. I then contacted a source with knowledge of the situation, and he said that the rival coach’s theory was correct. Posey, the source said, was drawing unfair criticism for failing to defend his teammate when in reality he was adhering to his teammate’s – or perhaps manager Bruce Bochy’s – wishes. Giants broadcaster Mike Krukow, according to reports on Twitter, said on KNBR Radio on Tuesday morning that Posey is under an order to “stay out” of fights, but did not say who issued the order. If such an order exists, or if it Strickland in this case made the request of Posey, not all of the Giants were aware of it. One Giant, when I asked if the players were OK with Posey not standing up for Strickland, seemed torn by Posey’s actions, unsure of what to think. He made no mention of any agreement between the two. The Giants could never acknowledge Posey’s understanding with Strickland, if indeed there was such an understanding, for it would be tantamount to admitting intent. Strickland, who had not hit a batter all season and just four in his 156-game career prior to Monday, offered the usual explanation afterward, telling reporters that he was only trying to pitch inside. Few will believe that — those who know Strickland were not surprised that he wanted to settle a score with Harper for the two mammoth home runs that the Nationals’ slugger hit off him in the 2014 Division Series. And perhaps few will believe that Posey was a willing accomplice to an incident that effectively left him open to retaliation in the eye-for-an-eye world of baseball justice — if my best player gets hit, then so does yours. 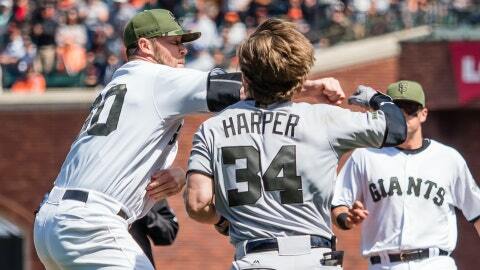 Posey, assuming he knew of Strickland’s intentions, probably could not have talked him out of hitting Harper, not when the reliever seemingly was hellbent on unleashing more than 2½ years of anger. But Posey at least could have done a better acting job — running after Harper, even halfheartedly — instead of remaining motionless. The other possibility, of course, is that Posey felt no obligation to defend the indefensible. My initial thought, in fact, was that Posey was the sanest man on the field. Strickland was foolish to act on a grudge that did not diminish even with the Giants’ triumph in the 2014 World Series. Harper, who was hit on the hip, not anywhere near the head, could have just laughed at Strickland on his way to first base — though that is easy for a casual observer to say; it’s different, always different, in the heat of the moment. 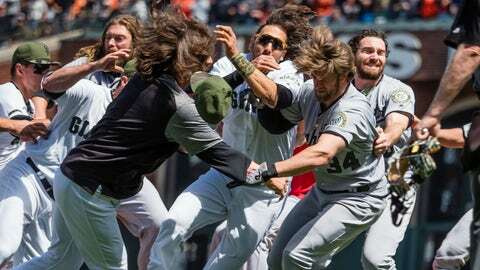 The idea of Posey disavowing Strickland evokes the recent memory of Dustin Pedroia’s “it wasn’t me” explanation to Manny Machado after the Red Sox’s Matt Barnes threw at Machado’s head. Each of these on-field incidents, though, is different. The Pedroia-Machado exchange happened after the fact. Posey’s “Atlas Shrugged” moment occurred in real time. Posey is the Giants’ franchise player, one of the game’s great models. Perhaps we’ll never know why he reacted the way he did. But the questions will linger, whether he was a party to a teammate’s retaliation or a conscientious objector.